It's Fitness Friday and my friend Sandy of God Speaks Today has returned from sunny southern California. She's back on the job as host of Fitness Friday. If you're a blogger and want to join in, simply write a post about health or fitness and link to Sandy. We always love to welcome new bloggers to Fitness Friday. Remember Friday = Health talk, OK? I'm sure Sandy had many opportunities to do lunch with all the celebrities in Beverly Hills, LA and Malibu. I heard a rumor that she had lunch with Angelina and Brad. Is that really true, Sandy? 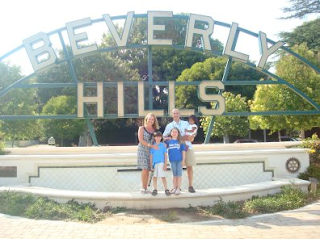 Take a look at this photo op of the Coopers in front of the famous Beverly Hills sign? Is that cool? But the big question is: Did they eat a healthy lunch? Well, you may not have time for a leisurely lunch. Maybe you have a few other mouths to feed ... like your children? Or maybe you only get a 30 minute break from work to have something quick to eat. So, what can you eat for lunch and still be healthy? How about a sandwich? Now, I'm not talking about a greasy burger or a bunch of processed meat on a submarine. So, what are you going to eat for lunch today? That is the question. And by the way, I read Sandy's Fitness Friday post and it's so good. She must be well rested after her vacation because she certainly did a great job. She's talking about our Fitness Witness. After all, our bodies are a temple of the Holy Spirit. What are we telling others by how we treat our bodies? You've got to check it out. And broiled veggies: onions, tomatoes, red peppers and zuchinni all drizzled with olive oil and salt, then put under the broiler until they start to char. And I did very well with my lunches in CA, thankyouverymuch. Lunches are something I work hard at being healhty, because I'm usually at home for those and I usually eat lunch just before or just after a work out. Yummm! I personally love alfalfa sprouts, and have several containers going at the same time (different growth stages), then just heap a very generous amount on one slice of whole grain bread with other nutritious fun bits and pieces. Sandwiches are a favorite food so I always welcome ideas. Thanks! Such helpful ideas sweetie, thanks. Just stopping by to say happy Saturday, my friend. I've missed you so and I appreciate your prayer support so much. I'm going to be emailing you privately because I got a call from my cardiologist yesterday and I would like to talk to you about it. Hmmmm, my mouth is watering just thinking about it. Thanks for splashin around with me on my blog. Your sweet comment blessed my day. Always helpful and informative Debbie!